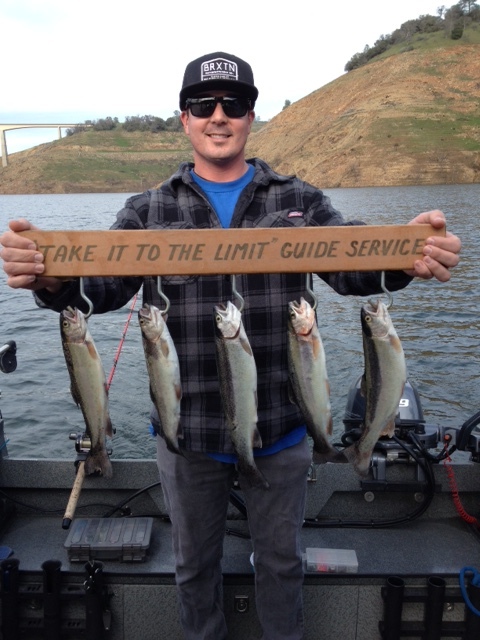 Last week was slow on New Melones Lake, but Sunday it was a different story. I went out to Melones to try to find some fish for clients this week and I got lucky and put 3 bows and 1 kokanee in the boat. The four fish weight was 6-pounds, 4-ounces, and believe this or not, the depth was from 15′ to 25′ and I saw plenty of fish in the 10′ range. I hope with the water coming up the bite just gets better and we put more fish in the boat with summer coming on. Pink and blue hoochies or gold spinners with pink and blue beads with pink blades top off with garlic corn worked Sunday. 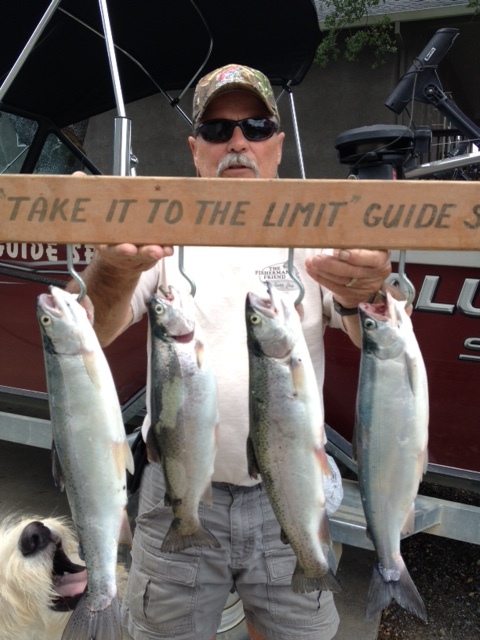 Take it to the Limit Guide Gary Burns went out to find some trout with client Tyson Enzweiler. They ended up with a limit of nice trout. They trolled a Cop Car Needlefish in 10′ of water to catch their fish. All their fish were caught above the 49-Bridge over the main river channel. Trolling between 2.8 and 3.2 mph seemed to do the trick.